The alate viviparous female Dysaphis aucupariae from the primary host has the abdomen ochreous to greenish-yellow with a black trapeziform dorsal patch on tergites III-V and spinal cross bands on tergites I and II. apterae on the secondary host are pinkish ochreous with reddish or brownish areas at the siphuncular bases.The alate from the secondary host is reddish ochreous with a blackish sclerotic pattern. 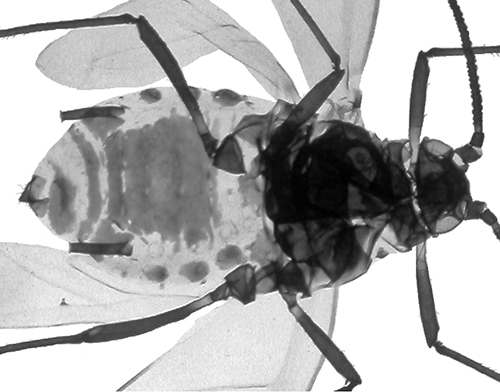 The clarified slide mounts below are of adult viviparous female Dysaphis aucupariae : wingless from the primary host, and winged spring migrant. 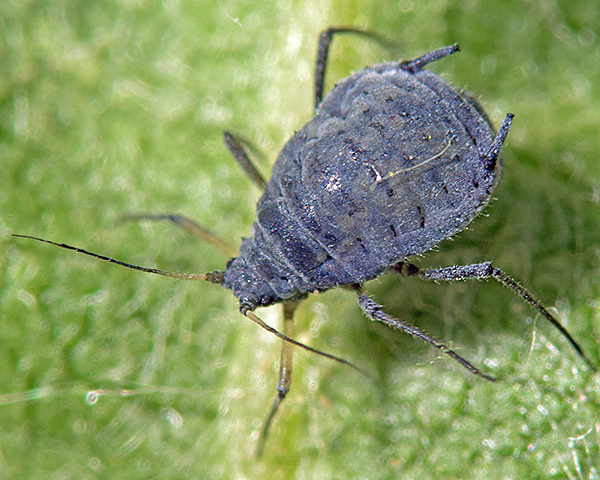 In April the fundatrices of Dysaphis aucupariae stimulate the development of rolled pseudogalls (see picture below). The pseudogall of Dysaphis aucupariae is initially pale yellow green, but soon becomes tinged with red. Its form is somewhat variable, either curled from the the leaf apex to the base (see above), or laterally (from the sides of the leaf inwards) (see below). Early in the year many more leaves may have limited galling than actually develop to an 'occupied' pseudogall. We initially assumed that this was the result of some of the gall initiators being predated before they could found a colony. However, very few predators were found apart from a few earwigs. Another possibility was that some of the rather mobile young larvae (see picture below) were visiting and feeding on several leaves before settling on one as the eventual site to found a colony. This would have the advantage of stimulating a number of empty pseudogalls which would confuse potential bird predators. 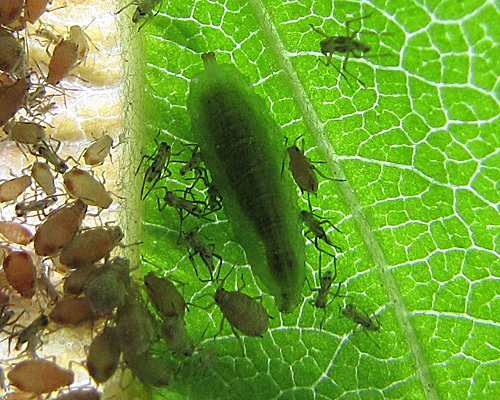 Aphid colonies in the pseudogalls are heavily waxed (see picture below) and often attended by ants. Later in the year colonies can sometimes develop on more mature leaves (see picture below) which then develop very little apparent galling. 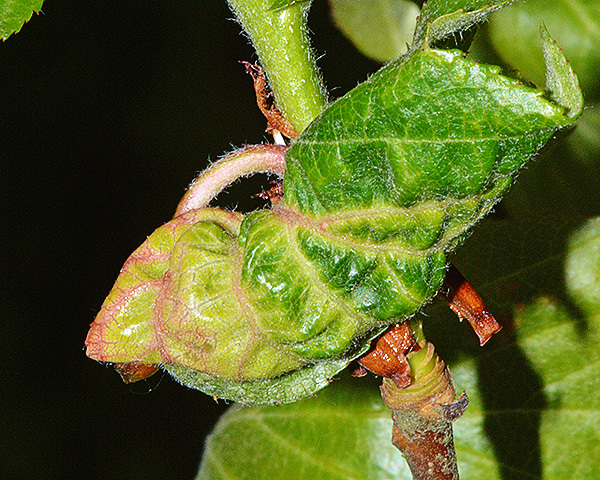 Predators are frequently present in the galls, especially syrphid larvae (see picture below). 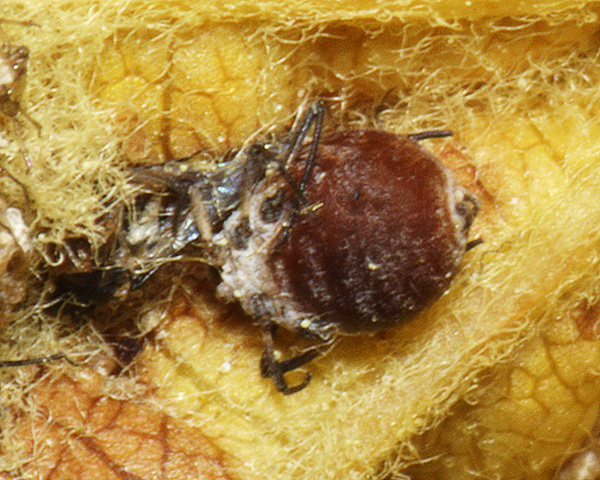 Parasitoids also enter the galls. The picture below shows a mummified aphid from a leaf gall in Kent. Sometimes all the leaves on a tree are infested with aphids and then, some weeks later, the whole tree is bare branched. Sunde (1984) records the apparent establishment of a Dysaphis aucupariae population in New Zealand. 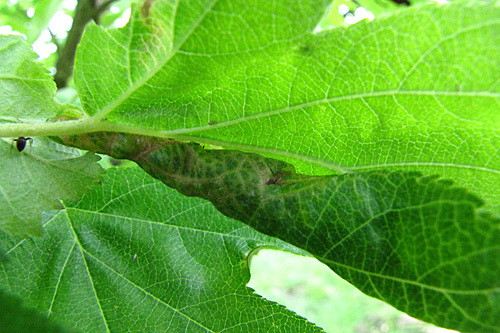 Since the wild service tree is not present in New Zealand, it is generally assumed that the population is maintaining itself on the secondary host. Buckton (1877) reports that the species also feeds on rowan (Sorbus aucupariae) which is found in New Zealand. Possibly it does use rowan in New Zealand, but in Europe it is found far more often on wild service tree. Dysaphis aucupariae has been recorded from 1 Sorbus species (Sorbus torminalis). 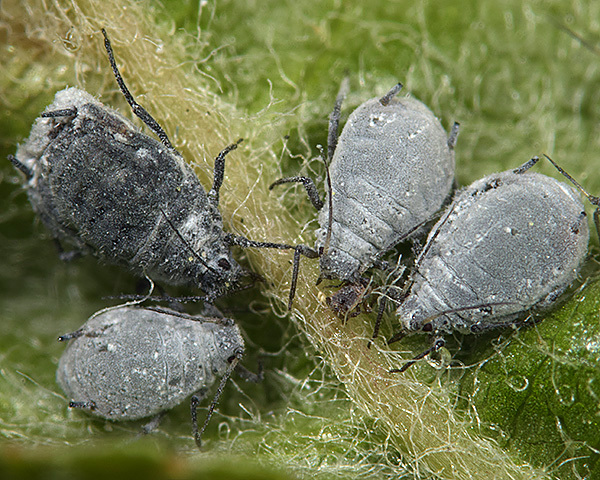 Blackman & Eastop list 4 species of aphid as feeding on wild service tree (Sorbus torminalis) worldwide, and provide formal identification keys. 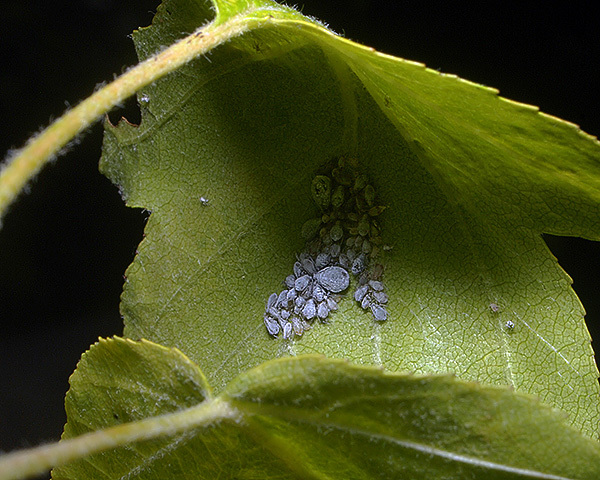 Of those aphid species, Baker (2015) lists all 4 as occurring in Britain: Aphis pomi, Dysaphis aucupariae, Dysaphis sorbi and Rhopalosiphum oxyacanthae. Dysaphis aucupariae has been recorded from 3 Plantago species (Plantago lanceolata, Plantago major, Plantago media). Blackman & Eastop list 17 species of aphid as feeding on ribwort plantain (Plantago lanceolata) worldwide, and provide formal identification keys. 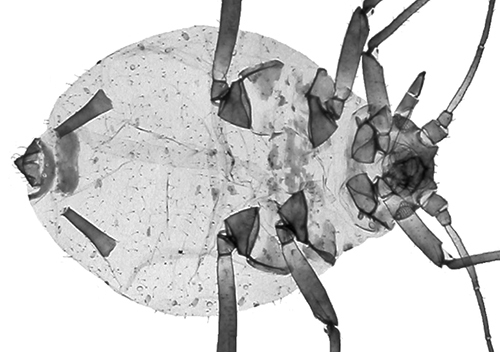 Of those aphid species, Baker (2015) lists 16 as occurring in Britain: Aphis fabae, Aphis gossypi, Aphis longirostris, Aphis nasturtii, Aphis plantaginis, Aphis solanella, Aulacorthum solani, Brachycaudus helichrysi, Brachycaudus lucifugus, Dysaphis aucupariae, Dysaphis maritima, Dysaphis plantaginea, Macrosiphum euphorbiae, Myzus ascalonicus, Myzus ornatus and Myzus persicae. Blackman & Eastop list 22 species of aphid as feeding on broadleaf plantain (Plantago major) worldwide, and provide formal identification keys. 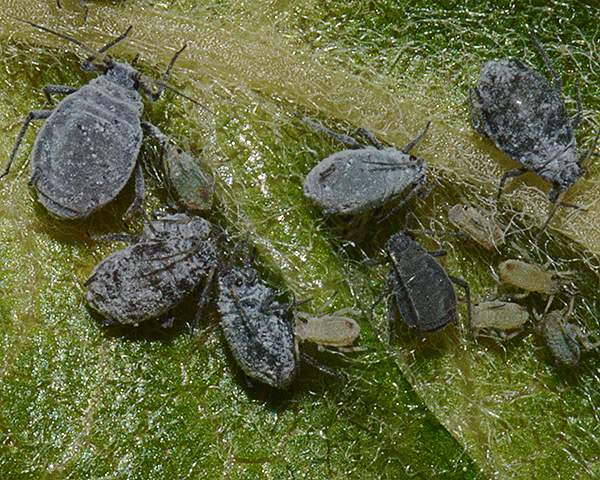 Blackman & Eastop list 9 species of aphid as feeding on hoary plantain (Plantago media) worldwide, and provide formal identification keys. 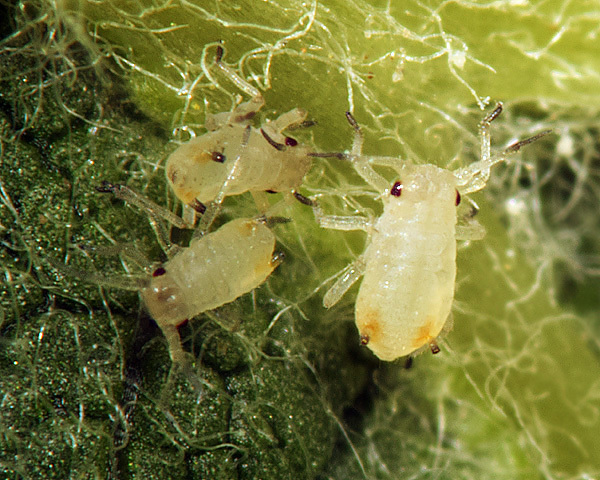 Of those aphid species, Baker (2015) lists 7 as occurring in Britain: Aphis fabae, Aphis longirostris, Aphis nasturtii, Aphis plantaginis, Brachycaudus helichrysi, Dysaphis aucupariae and Dysaphis plantaginea. Our sincere thanks to Jula Werres for some of the pictures shown above. We also thank the UK Forestry Commission Bedgebury Pinetum for their kind assistance, and permission to sample. Sunde, R.G. (1984). 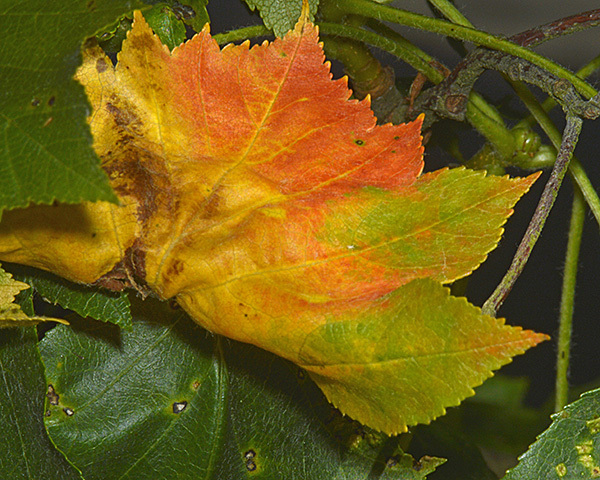 New records of plant pests in New Zealand 4. 7 aphid species (Homoptera: Aphidoidea). New Zealand Journal of Agricultural Research 27, 575-579.